Many middle aged Americans are caught between a rock and a hard place financially. They are the so-called sandwich generation, having to take care of both kids and parents at the same time. This has recently been a subject of discussion with clients of mine. They are a self made millionaire couple. their parents however, are relatively poor. They have enough to live on by themselves, but if they ever got sick, they would be financially dependent on their children for care. To that end, my clients have set aside $1m just in case. I suggested they fork over a few hundred a year to pay for their parents’ gym memberships. If their parents actually use the memberships, my clients may never need to spend the million. One study noted that people over 65 need on average $236k in out of pocket medical expenses for the rest of their lives. This number is heavily skewed by the sickest people; the sickest 5% need ten times that, while the healthier 50% only need a fraction. Give your parents a gym membership, and it’s not hard for them to get into the healthy half . 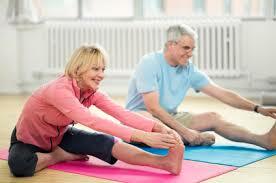 I have a gym membership myself and I am amazed how many seniors I see doing group yoga and pilates. For them, exercise is not hard work but an enjoyable social activity. Not surprisingly, many of them have better core strength and flexibility than I do! They can do better bicycle kicks than me and hang out in the tree pose twice as long I can. There are many ways to take care of your parents. You could pay for them to get down doing the downward dog, or you could pay for their long term medical care. I know which one I’d rather fund. 1 Response to "Send Your Parents to the Gym, Not the Doctor"
This not only lowers medical expenses. Being healthier for longer also (more importantly) increases their quality of life.